To support leaders and those involved in providing medical care on expeditions in wilderness environments, the Faculty of Pre-Hospital Care (FPHC) of The Royal College of Surgeons of Edinburgh convened an expert panel of leading healthcare professionals and expedition providers. The aims of this panel were to: (1) provide guidance to ensure the best possible medical care for patients within the geographical, logistical and human factor constraints of an expedition environment. (2) Give aspiring and established expedition medics a ‘benchmark’ of skills they should meet. (3) Facilitate expedition organisers in selecting the most appropriate medical cover and provider for their planned activity. A system of medical planning is suggested to enable expedition leaders to identify the potential medical risks and their mitigation. It was recognised that the scope of practice for wilderness medicine covers elements of primary healthcare, pre-hospital emergency medicine and preventative medicine. Some unique competencies were also identified. Further to this, the panel recommends the use of a matrix and advisory expedition medic competencies relating to the remoteness and medical threat of the expedition. This advice is aimed at all levels of expedition medic, leader and organiser who may be responsible for delivering or managing the delivery of remote medical care for participants. The expedition medic should be someone equipped with the appropriate medical competencies, scope of practice and capabilities in the expedition environment and need not necessarily be a qualified doctor. 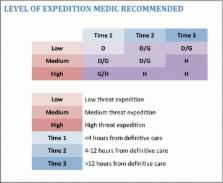 In addition to providing guidance regarding the clinical competencies required of the expedition medic, the document provides generic guidance and signposting to the more pertinent aspects of the role of expedition medic.Electronic supplementary materialThe online version of this article (doi:10.1186/s13728-015-0041-x) contains supplementary material, which is available to authorized users. The impact of emergency obstetric care training in Somaliland, Somalia.